A new poll shows the race settling into a two-person contest between Macron and Le Pen, but Fillon is hanging on to his ~20%, while Macron's support is remarkably soft, with 58% of his voters saying they could still change their minds, compared with only 24% of Le Pen's voters. With the left-wing candidates going nowhere, it's not clear where Macron's supporters would go if they lose confidence in him. As I reported last week, the expected level of abstention in this year's presidential is abnormally high. A new study confirms the one I mentioned previously, and the softness in the center in particular is no doubt alarming to the campaign of Emmanuel Macron. I don't have time to analyze these findings in detail today, but I will return to this topic in the future. 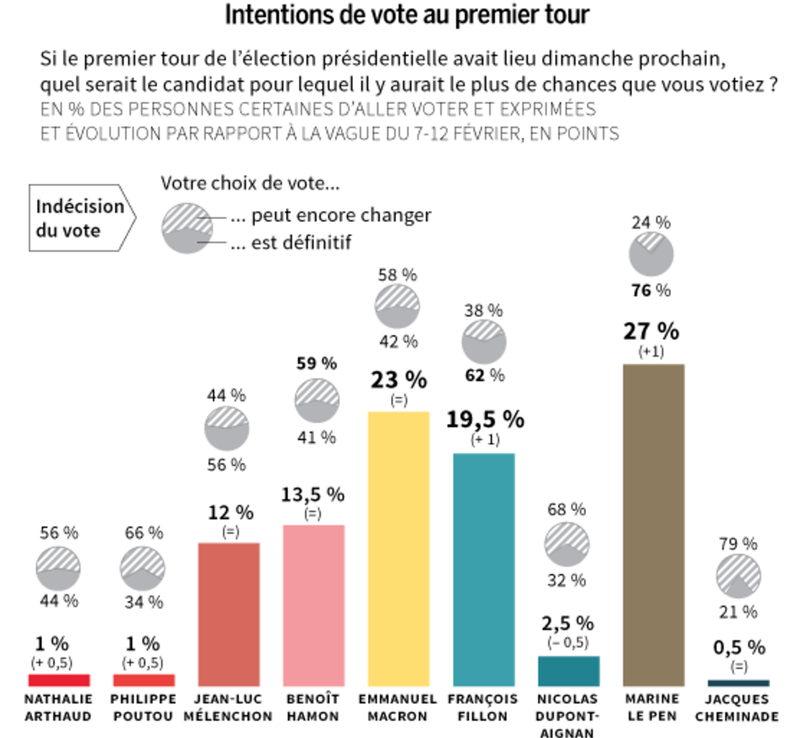 It's a new and interesting development in French politics, in which participation in presidential elections has historically been high. Apparently, the decomposition of the party system and the blurring of the left-right divide has left many voters disoriented and unsure which way to turn.